She fought her way through the throngs of people. Every inch was a battle, but her objective was in sight. “If only I can reach him”, she thought, “maybe I can be healed.” Still more people seemed to teem from neighboring dwellings as curiosity got the better of them and they had to see what this crowd was doing. As Jesus continued to walk, so the crowd of people following Him grew as well, but she was determined to reach Him. Finally after pushing past another person, she found herself directly behind him. This was it. This was her moment. If she didn’t do it now her chance would be gone and so would the possibility of being healed. She had heard of his miracles, that he could heal. The woman had visited numerous “healers” yet none of them could help her. She had all but given up any hope of complete restoration of her health, until she heard Jesus was coming. Now, directly behind the healer, she reached out to touch him. In her mind she had already believed that if he could heal her all she would have to do is touch him. So with arms extended and fingertips stretching outward, she touches him. What happens next not only confirms her belief, but ignites hope again within her heart and mind. A power surge unlike any other is felt throughout her body. What began as a simple touch of her fingertips sends a pulse of energy to her elbow, her shoulder, her hips, her knees and even her feet. Wide-eye and surprised Jesus suddenly stopped walking and turned to the crowd. “Who touched my clothes?” He asked. Some of the crowd mumbled things like “we all touched you”, “I just bumped into you”, and “perhaps it was me”…but that wasn’t what Jesus meant. He had felt power leave His body, and He looked for the one who had intentionally touched Him. 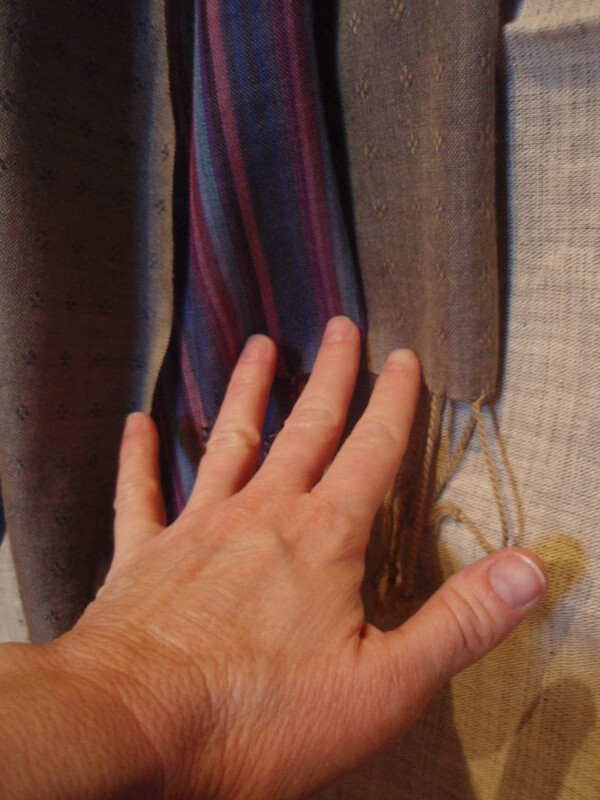 The woman who had suddenly been healed by the simple touch of his clothing knew instantly that Jesus was looking for her. In just mere seconds she had a decision to make, she could simply disappear back into the crowd and go home, or she could admit to Jesus that it had been she who had touched Him. She didn’t hesitate, but came forward and fell at His feet. Perhaps she was afraid He would be angry that she hadn’t asked Him to heal her. Perhaps she thought He might take His healing from her. 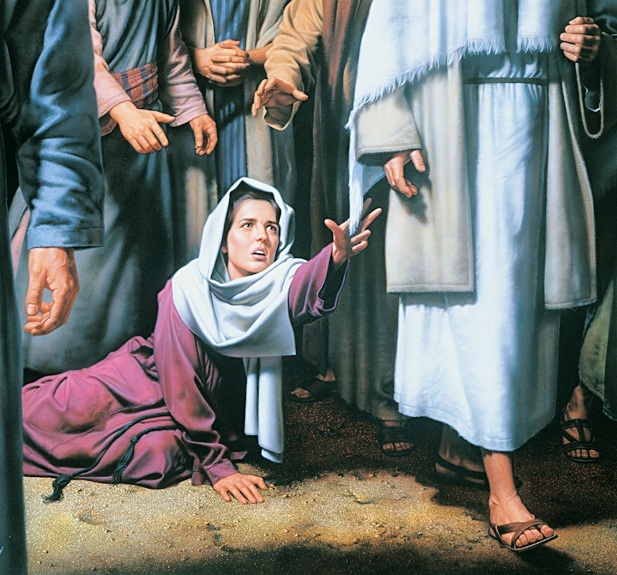 But she knelt anyway and admitted to Jesus that she had touched him in the hopes of being healed. Jesus’ response to her wasn’t anger or disappointment. He looked down upon her with love and compassion and said to her, “Daughter, your faith has healed you. God in peace and be freed from your suffering.” (Mark 5:34) Her last ditch effort to find healing had paid off. She had been desperate and had suffered greatly over the years from this malady, and now she was completely healed and free from disease and suffering. Isn’t that what Jesus does for all of us? We suffer from so many issues in this life. Some suffer from actual physical ailments and diseases, while others suffer from spiritual diseases that pillages and ravages the heart and mind. Yet Jesus comes to all, and though perhaps we have tried everything else without success, Jesus is there before us. Perhaps it’s time. Perhaps it’s your last ditch effort to find healing that no one else can provide you with. If only you would reach out and touch Him and find that He has the power to save ultimately and completely! This is the kind of “last ditch effort” that has an eternal outcome. Belief isn’t easy, yet this woman so long ago, who was clinging to her last hope reached out to a Savior who healed permanently. Will you reach out to Him today? Are you willing to place your faith in His mighty power? He wants us to all believe in Him. He loves us so deeply and stands ready to heal and save.